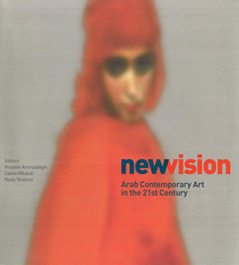 BOOK REVIEW – New Vision: Arab Contemporary Art in the 21st Century, Hossein Amirsadeghi, Salwa Mikdadi and Nada Shabout (eds. ), London, Thames & Hudson, 2009, 288 pages. While taking notes to write the present review, I was confronted with a set of questions very similar to the ones that the recently published New Vision: Arab Contemporary Art in the 21st Century, sought to tackle. In their most general sense, these questions are about the problem of history, or rather, the ways of writing histories. 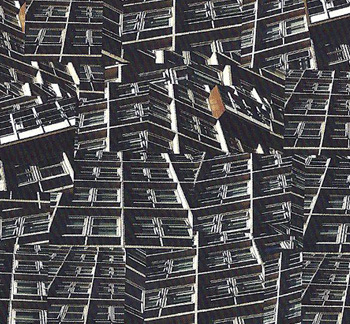 Much of the art addressed in New Vision deals with terms such as “hybridity” and the “diasporic” as constitutive conditions of the contemporary in relation to so-called Middle Eastern art – or, at least these terms seem to always crop up whenever non-Western art is being shown in the Euro-American contexts. Co-editors Nada Shabout and Salwa Mikadi also make clear in their introduction that “the lack of a written historical context – an art historical context or discourse to place, view, articulate and evaluate this new production” is one of the core problems in a moment when art from the Middle East is increasingly coming under the spotlight”. Shows such as Unveiled: New Art from the Middle East (2009) at the Saatchi Gallery in London, and the presence of artists and artworks from the Arab region and Diaspora in global art fairs such as Basel and Frieze, their inclusion in international panel discussions, their collection by museums and private individuals, and the emergence of new art spaces in the Gulf seem to underline growing “recognition” or “success”. However, this inclusion seems to often occur in ways that reiterate and foster Orientalist, Western-centric views, with the effect of objectifying artists and their works within nation-based or geographically specific territories. To its credit, the book places emphasis on critical art practices and is open to sketching a different agenda for contemporary art in the Arab world. On an editorial level, this ‘agenda’ unfolds in two distinct parts. The first part of the book includes an introduction and five essays that map the multiple, historical and conceptual contexts necessary to grasp the current “scene”, and a second part is devoted to the presentation of artists, galleries and other organisations that compose that landscape. Nada Shabout’s essay ‘Contemporaneity and the Arab World’ and Sarah Rogers’ ‘Imagined Cartographies: Diaspora and Contemporary Arab Art’ both show how – by way of a re-evaluation of the notion of “modernity” for the first one, and a close analysis of the logics of globalisation and migration for the second – the very concept of “Arab art” is subject to a transformation that is the result of a negotiated position from western world views. Not only is “arabness” fluid, but the forms and strategies contemporary art from the Arab region adopts also expands the very notion of what art can be. These aspects can be gleaned from the trajectories of artists from the Arab region in museums and collections (addressed in Venetia Porter’s essay), in addition to collaborations between the art world and the world of non-profit NGOs. The originality and importance of the latter is that it has become a vehicle for building alternatives to conservative or non-existing public funding channels, or to market-oriented initiatives. and a conscious will to expand and interrogate the interweaving of visual culture and politics (at the risk of sometimes becoming didactic), many of the practitioners presented in New Vision operate on a more “familiar” plane. Well-known artists such as Mona Hatoum and her sculptural/installation works, Susan Hefuna’s witty play with traditional structures and symbolism, or Mounir Fatmi’s investigation of political language, make use of aesthetic conventions that are less bound to the necessity of finding new means to convey new ideas. These works, such as Taysir Batniji’s take on Bernd and Hilla Becher’s work, are nevertheless highly thoughtful and effective, and certainly contribute to the effort of re-defining our contemporary aesthetic and social experiences. New Vision might simply be the name for what used to be a monolithic vision of Arab art, which, à propos has, since the time of art-making in the region, always held a plurality of visions. Thus, what the editors of New Vision have attempted to propose regarding the Arab world echoes with Achille Mbembe’s ideas about Africa in On the Postcolony (2001). For him, the latter “exists only as a series of disconnections, superimpositions, colours, costumes, gestures and appearances, sounds and rhythms, ellipses, hyperboles, parables, misconnections, and imagined, remembered, and forgotten things, bits of spaces, syncopes, intervals, moments of enthusiasm and impetuous vortices – in short, perceptions and phantasms in mutual perpetual pursuit, yet coextensive with each other”. If New Vision succeeds in presenting hybridity and its many coextensive dimensions, one hopes for this to be a continuing trend. Adeena Mey is a critic and researcher. He has written and translated on contemporary art and culture for diverse publications. His most recent essay is ‘Cosmic Diagram. On Ecke Bonk’s Exhibition and Mélanie Althaus’ Architecture’ (in Stefan Banz (ed.) Marcel Duchamp and the Forestay Waterfall, JRP-Ringier, 2010). Currently he is a collaborator of the project Schweizer Film Experimente based at the Zurich art school and the University of Lausanne where he is a PhD candidate.